"The U.S. Soccer Girls' Development Academy program will raise the standards and assure that the pathway for the most talented and dedicated female players exists, and that we will be able to continue to compete with the elite players and teams in the world," Girls' Academy Director Miriam Hickey said. "To achieve this, we must commit to a positive training and game environment at the club level to ensure the best players are playing together and not one talented player is overlooked." Hickey and Heinrichs will hold a conference call on Wednesday, Aug. 23 at 3 p.m. ET to discuss the Girls' Academy launch. A global leader in women's soccer, U.S. Soccer's implementation of the Girls' Academy is part of the Federation's efforts to grow the game and ensure that future National Teams continue to win at the highest level. Several current and former Women's National Team players are involved in the Academy to further this mission. Their experiences winning FIFA Women's World Cups and Olympic gold medals will be invaluable in raising the standard for female youth players. U.S. Soccer is launching the Girls' Academy with backing from the National Women's Soccer League. Now in its fifth year, the league is the longest-tenured women's professional league ever in the United States. 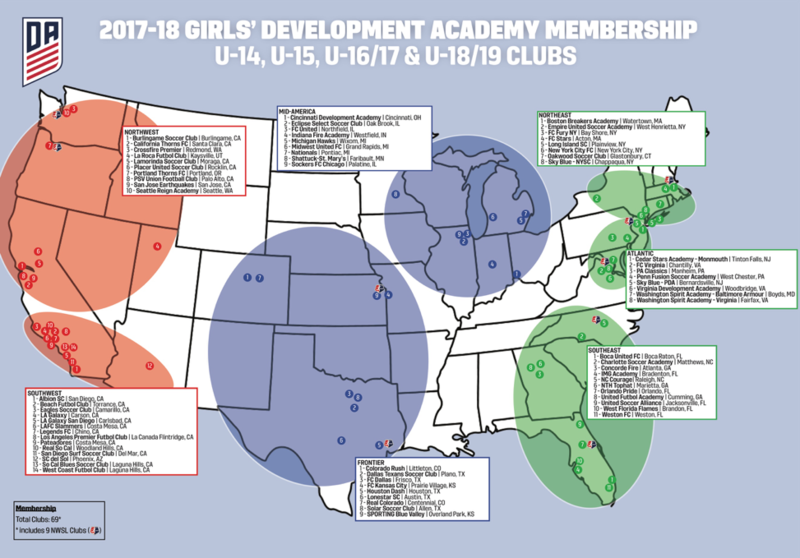 A total of 11 Girls' Academy clubs are affiliated with NWSL teams, marking a major step forward in the league's player development initiatives and the long-term growth of women's professional soccer. For its first season, the Girls' Academy will feature four age groups: U-14, U-15, U-16/17 and U-18/19 competing in seven divisions across the country. Teams play consistently over a 10-month season from September to July, featuring Winter, Spring and Summer Showcases and culminating in the Academy Championships. The inaugural 69 clubs were chosen based on a variety of factors, including club leadership, infrastructure, resources, history of player production for National Teams, market and depth of the player pool and more.